The name and phone number you enter in the Fax Setup Wizard will appear in the fax header on your faxes. See below for instructions on using the Fax Setup Wizard. You can setup the product's basic fax settings using the Fax Setting Wizard. This wizard is automatically displayed when the product is turned on for the first time. 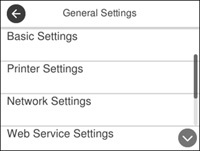 You can also change these settings individually from the Fax Settings menu. Scroll down and select Fax Setting Wizard. The Fax Setting Wizard screen appears. On the Fax Header screen, use the displayed keypad to enter the sender name for your fax source, such as your name or a business name. You can enter up to 40 characters. On the Your Phone Number screen, use the displayed keypad to enter your fax number, up to 20 characters. Note: The name and phone number in the fax header identifies the source of the faxes you send. If you have subscribed to a distinctive ring service from your telephone company, select Proceed. Select the ring pattern to be used for incoming faxes or select On. Go to step 12. If you do not have a distinctive ring service, select Skip and go to the next step. Note: Distinctive ring services allows you to have several phone numbers on one phone line. Each number is assigned a different ring pattern. You can use one number for voice calls and another for fax calls. Select the ring pattern assigned to fax calls in the Distinctive Ring Setting. If you select On or a ring pattern other than All, Receive Mode is automatically set to Auto. If you have connected an external telephone or answering machine to the product, select Yes and go to the next step. On the next Receive Mode Setting screen, select Yes to receive faxes automatically or select No to receive faxes manually. Note: If you connect an external answering machine and select to receive faxes automatically, make sure the Rings to Answer setting is correct. If you select to receive faxes manually, you need to answer every call and operate the product’s control panel or your phone to receive faxes. On the Proceed screen, confirm the displayed settings and select Proceed, or press the back arrow to change the settings. On the Run Check Fax Connection screen, select Start Checking and follow the on-screen instructions to check the fax connection and print a report of the check result. If there are any errors reported, try the solutions on the report and run the check again. If the Select Line Type screen appears, select the correct line type. If the Select Dial Tone Detection screen appears, select Disable. However, disabling the dial tone detection function may drop the first digit of a fax number and send the fax to the wrong number.